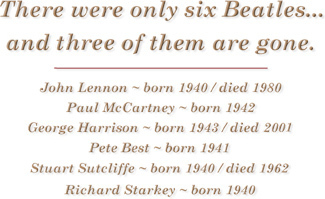 Pete Best is famous as the original drummer for the most important group in the history of recorded music. The twentieth century phenomenon that millions came to know and love as The Beatles made a mark that can never be erased. They are credited with changing a generation and will forever be remembered as an enduring symbol of the sixties, a time identified with constant change and turmoil. The civil rights movement, the assassinations of John F. Kennedy, Robert Kennedy and Martin Luther King, the war in Viet Nam, the hippie movement, Woodstock, the lunar landing and The Beatles all define one of the most important decades of the twentieth century. 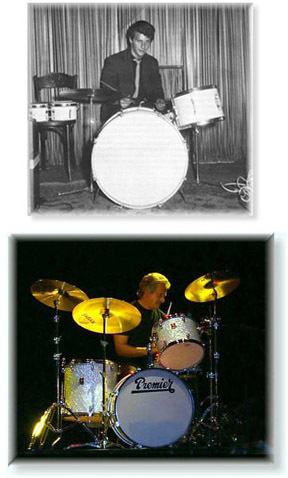 Pete Best was The Beatles' drummer in their formative years. He performed literally hundreds of shows with John Lennon, Paul McCartney and George Harrison for more than two years. He was a member of the group when they developed a fanatical following in Liverpool and in Hamburg. The Beatles' story documents Pete Best as the drummer who performed on the group's first recording sessions in Germany, on the famous Decca Records sessions and was the group's drummer when they met and auditioned in London for George Martin. Pete Best's place in the history of The Beatles' story cannot be diminished. Just as the group was about to embark on a journey into the history books, in a swirl of controversy, Pete Best was replaced by Ringo Starr. Pete Best stepped out of the music world for a time but returned with his new band in 1989. The focus has been on establishing Pete to a worldwide audience. Much interest is being shown in the man and his story. 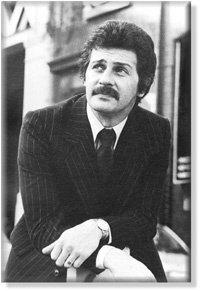 After the release of his new book, Beatle: The Pete Best Story, he appeared on the Oprah Winfrey Show, The David Letterman Show and was a guest with Geraldo Rivera. A CD called Back To The Beat was recorded live at The Cavern Club in Liverpool. The Beatles Anthology issued in November 1995 contains ten tracks featuring Pete Best. Best of The Beatles sees Pete Best involved in a world tour that will include concert dates in Japan, Russia, Malaysia, Poland, Holland, Canada, the United States, Brazil, South Africa, Britain and Ireland. The dates will take the show well into next year. The presentation is divided into two segments. The first programme brings to audiences a narrative accounting of The Beatles' story during their early years in Liverpool and Hamburg. It traces the effect of American rock and roll on English teenagers in the late fifties and early sixties and it looks at The Beatles as individuals, exploring the influences they used to create their own special brand of magic. The clubs of Liverpool and Hamburg are discussed as the backdrop to illustrate how The Beatles climbed past all of their contemporaries to become the #1 group in the north of England. Their management by Brian Epstein, failed recording tests and the struggle that led to their eventual recording contract in London are all a part of the incredible story. Through a question and answer segment audience members are invited to talk to the man who was a part of it all, giving them the opportunity to find out first hand the answers to any questions they may have. The second of the two programmes gives the audience a rare glimpse of the music that made The Beatles so entertaining live. In a one hour show, the raw excitement and energy that was a part of the early years is captured accurately by the drummer who helped make it happen. His input and guidance keeps the band focused on the essential elements of what made The Beatles the band they became. An evening with Pete Best is time spent with a major player in the chronology of The Beatles' early years as they moved toward their appointment with fame. Truly a tour worth taking. And this tour is not guided by those who can only imagine what it must have been like or who were born years after it happened. It is led by a member of The Beatles who was there at the time, performing to audiences when fans were yelling the names John, Paul, George and Pete. A time to hear the musical memories of an era that seems long gone. Spending an evening with Pete Best is a chance to spend time with a true participant in musical hist	ory. Pete Best was born in Madras, India in 1941. His father, John, was a successful boxing promoter who had enlisted during World War II and had been sent to India as a physical training instructor. In Delhi, John met and married a young Red Cross worker named Mona who had been born there of English parents. After the war ended the Bests moved to Liverpool. The family moved frequently and eventually settled down in the suburb of West Derby at 8 Hayman's Green. Pete went to Blackmoor Park School, then to junior high, and finally to Collegiate High School, where he won a scholarship when he was seventeen. He began playing drums at an early age and his influences came from drummers like Gene Krupa and later, Joe Morello. In August of 1959 his mother opened a coffee club called The Casbah and began to offer live entertainment on the weekends. 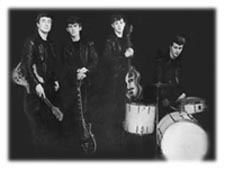 One of the first groups to perform was The Quarry Men which at the time included John Lennon, Paul McCartney and George Harrison. Since the group had no steady drummer, from t	ime to time Pete would sit in on drums. One evening in August of 1960 Pete received a phone call from Paul McCartney. Paul told him the group, which had recently changed their name to The Beatles, had been offered engagements in Hamburg and needed a permanent drummer. Pete accepted on the spot and after two dates at Liverpool's Jacaranda Club, the group was on its way to Germany. Hamburg was not at all what The Beatles had expected. When the group arrived fifteen years after World War II had ended, the city was a depraved sintown whose criminal and sexual activity were known all over Europe. After the Berlin Wall went up, gang wars erupted when East German criminals streamed into the city from Berlin. Violent clashes between these undesirables involved the numerous nightclubs, which usually employed more bouncers than waiters. Against this backdrop The Beatles spent two months playing mostly American hit records by artists like Fats Domino, Carl Perkins, Elvis Presley and Little Richard. In those days their shows sometimes started at 12:30 PM and ran until 2:00 AM in the morning. As their popularity with the German audiences grew The Beatles started attracting increasingly large crowds into seedy nightclubs like The Indra and The Kaiserkeller. As the incredibly long days wore on and on, the group began to improve and achieved a sound and a style that was truly unique. John Lennon sa that The Beatles really developed as a band in Hamburg. Club owners used to rouse the group by yelling 'mach shau', loosely translated as 'make show' or 'make it lively'. To get the Germans going and keep it up for more than eight hours, day after day, week after week, the boys really had to work. They would try anything and the Germans liked it, as long as it was loud. Returning to Liverpool after their first trip to Hamburg John, Paul, George and Pete began to play lunchtime engagements at The Cavern on Mathew Street. During the next two years The Beatles performed nearly 300 dates at the club as their popularity grew. 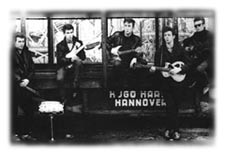 In the spring of 1961 the group was set to make their second trip to Hamburg. This time they were to alternate shows with Tony Sheridan, a singer they had met on their first trip to Germany. Sheridan was about to do some recording and asked The Beatles to be his backup group. It was this recording session that produced My Bonnie, a song that eventually played such a pivotal role in The Beatles' story. The session producer was so impressed with the group that he set up a separate session for John, Paul, George and Pete without Tony Sheridan. Historically, this is The Beatles second true recording session. When the boys got home to England they were on a roll. They had been named the most popular band in Liverpool and were regulars at The Cavern as well. All the excitement surrounding the group caught the attention of a young record store manager named Brian Epstein. He was intrigued with the stir they were causing and decided to go and see them. The meeting eventually resulted in Epstein's offer to manage The Beatles and the contract was signed in Pete Best's home in December of 1961. Brian Epstein's first task was to try to clean up the group's image. He arranged for professional photographs and then set about to obtain a recording contract for The Beatles. His first contact with a major record company was Decca Records. The group was invited to London to audition in January of 1962. John, Paul, George and Pete recorded fifteen songs which have recently surfaced on The Beatles Anthology released in November of 1995. A couple of months after their demo session, Decca Records called Brian Epstein to say that, groups of guitarists were on the way out'. The company was not interested in The Beatles. Epstein was not deterred. He became even more determined to land the boys a recording contract. While The Beatles had gone back to Hamburg for the third time, Epstein pounded the streets of London trying to interest record companies in signing the group. Finally, a recording technician put him in touch with George Martin who worked for Parlophone Records which was a division of the music giant EMI. After a meeting between Brian Epstein and George Martin an audition was arranged. And so, in June of 1962, John, Paul, George and Pete travelled to London for the session. At the end of July, George Martin offered The Beatles a recording contract with Parlophone Records. In August, Brian Epstein met with Pete Best and informed him that the group was going to change drummers. After two years as The Beatles' drummer, which included three major trips to Germany, the tremendous success in Liverpool and on the brink of a contract with one of the biggest recording companies in England, Pete Best was out - Ringo Starr was in. Kevin Macmichael worked steadily in the Maritime music scene before deciding to emigrate to England. He left Canada in June of 1985 to form a band in London with British songwriter Nick Van Eede. The group was called Cutting Crew and Broadcast, their debut album for Virgin Records, included the hit songs, (I Just) Died In Your Arms and I've Been In Love Before. The former was the number one record in 19 countries around the world in 1987. For the next three years Cutting Crew toured extensively throughout Europe, America and the Far East. The group was nominated for a Grammy Award as Best New Artist and appeared on dozens of international television programmes, including the UK's Top of the Pops and the Johnny Carson Show in the United States. As a member of Cutting Crew, Kevin co-wrote and produced three more albums for Virgin Records: The Scattering (1988), Compus Mentus (1991) and The Best of Cutting Crew (1992). During 1992, Kevin was approached by former Led Zeppelin vocalist Robert Plant and Tears for Fears producer Chris Hughes to collaborate on Plant's Fate Of Nations CD for Phonogram/Fontana. Kevin is featured as guitarist and co-writer on the 1993 recording. With the release of Fate of Nations, Kevin became the musical director for Plant's touring band. Their summer tour kicked off with dates in Prague, Budapest and Paris. The Robert Plant Band spent most of the summer touring Europe as a double header with Lenny Kravitz. The Fate of Nations tour ended with an appearance at the Glastonbury Festival with a sell-out crowd of more than 90,000. Toward the end of 1993 Kevin decided to leave Plant's band and was replaced by Jimmy Page. After almost nine years of working out of London, England, he chose to return to Canada. This was truly an opportunity to bring his song writing and production skills back to the industry and the region in which he developed much of the talent that took him around the world. Sadly, Kevin lost his long battle with cancer on December 31, 2002. Floyd King has been involved in the music industry for almost thirty years. He is a seasoned veteran of the Atlantic Canadian club circuit and a tremendously skilled songwriter. His song, Come Home To Nova Scotia, won out over more than two hundred other submissions for selection as the theme in Nova Scotia's Old Home Summer campaign to increase tourism to the province. The novelty song released with SPICE, Give Me Money For Christmas is still played each holiday season more than fifteen years after it was recorded. He has appeared on radio and on television many times, including spots on the Tommy Hunter Show and the Canadian Country Music Awards Show. Song writing and production have always been the areas of the music industry that Floyd felt most content developing. He often wears a producer's hat these days and his work producing and co-writing songs on Terry Kelly's Divided Highway CD helped to win awards from the ECMA, the CCMA and from SOCAN in recent years. The production values that Floyd brought to the Divided Highway project resulted in Terry Kelly being nominated to receive a Juno Award for Vocalist of the Year in 1995. Continuing his collaboration with Terry Kelly, Floyd produced the majority of tracks on Terry's CD, Far Cry From Leaving. Floyd has performed across Canada, the United States and Australia and can occasionally be seen as the featured guitarist with Terry Kelly's touring band. Paul Eisan has always been busy in the world of the performing arts. His amazing vocal talent brought him to the attention of Neptune Theatre's directors and he was given a part in their production of Joseph and the Amazing Technicolor Dreamcoat. When Theatre New Brunswick needed the services of a powerful vocalist, they too turned to Paul for their production of John Gray's, 18 Wheels. His first self-titled album release resulted in a mild regional hit with Mississippi born Jerry Butler's 1969 recording, Only The Strong Survive. The album was recorded as part of the Canadian Talent Library Series. In recognition of his tremendous natural talent he was asked by the producers of both Anne Murray and Roger Whitaker to take part in national television specials highlighting top Canadian artists. Paul has given live concert performances in Holland, Bermuda, Philadelphia, Baltimore, Boston and New York. Paul's song writing abilities resulted in his collaboration with Terry Kel	ly on the recording, California Nights. A spin-off of his ability to write songs was the development of a successful radio and television jingle career. His voice can still be heard on many of the region's top advertising spots. He was selected by the television network, MITV to write and perform the station's all new promotional spots which aired almost hourly for three years. The Toronto based CHUM network asked Paul to sing in their 1992 campaign to strengthen Canadian unity. He performed the wonderful, Christmas In Canada that year for audiences coast to coast. Most recently, Paul wrote and recorded the CD, After Forty Years, which reflects his deep interest in country music. Another direction for the multi-talented performer whose signature is the power of his voice and the quality of his art. During the first show Pete Best delivers a narrative accounting of The Beatles' story during their formative years in Liverpool and Hamburg. It traces the origins of various musical and not so musical groups that eventually led John Lennon, Paul McCartney, George Harrison, Stuart Sutcliffe and Pete Best to find themselves working together in the band that would later define a generation. Pete discusses the era of skiffle music and the effect of American rock and roll on English teenagers in the late fifties and early sixties. He talks about The Beatles as individuals, exploring the influences they used to create their own special brand of magic. The 'Mersey Sound' is explained and the clubs of Liverpool and Hamburg are viewed as a backdrop to illustrate how The Beatles climbed past all of their contemporaries to become the #1 group in the north of England. The presentation is a fascinating look at the origins of British pop music and the elements that led to what became known around the world as the British Invasion. 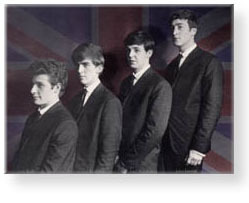 The group's involvement with Brian Epstein, their association with Jennings Musical Instruments and their signature Vox amplifiers, the reasons American musical equipment like Gibson, Gretsch, Rickenbacker and Ludwig could not be purchased in Britain, a discussion of failed recording tests and the struggle that led to their eventual recording session at Abbey Road Studios in London are all a part of the incredible story. Pete talks openly about the day Brian Epstein told him he was out of the group. Through a unique question and answer segment audience members are invited to talk to the man who was a part of it all, giving them the opportunity to find out first hand the answers to any questions they may have. The second of the two programmes gives the audience a rare glimpse of the music that made The Beatles so entertaining live. In a one hour show, the raw excitement and energy that was a part of the early years is captured accurately by the drummer who helped make it happen. His input and guidance keeps the band focused on the essential elements of what made The Beatles the band they became. 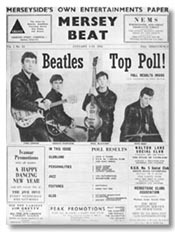 The performance includes American rock and roll influences The Beatles used to cover in their shows as well as songs The Beatles wrote early on and later became recognized by millions of people around the world. The presentation by Pete Best is a rare chance to bring the audience together with a major player in the chronology of The Beatles' early years as they moved toward their appointment with fame. Truly a tour worth taking. And this tour is not guided by those who can only imagine what it must have been like or who were born years after it happened. It is led by a member of The Beatles who was there at the time performing to audiences when fans were yelling the names John, Paul, George and Pete. A time to hear the musical memories of an era that seems long gone. Spending an evening with Pete Best is a chance to spend time with a true participant in musical history. Alabama songwriter Arthur Alexander was an early influence on John Lennon and Paul McCartney who covered his, Anna(Go To Him) on The Beatles' debut album. This song was performed by the group many times in Liverpool and Hamburg. A rare instrumental written by John Lennon and George Harrison. It was recorded in Germany on June 22, 1961 during the Tony Sheridan sessions; not at a real studio but at the Friedrich-Ebert-Halle school. It was originally called Beatle Bop. Also recorded backing up Tony Sheridan on June 22, 1961. It was released as a single in Germany and is important as The Beatles first appearance on commercial disc. This was the record that brought them to the attention of Brian Epstein. Written by Paul McCartney in Liverpool in 1961, this stage act standard was later recorded on The Beatles first album. Its original title of Seventeen had by then changed to I Saw Her Standing There. One of the five songs played on their first Ed Sullivan Show appearance. Part of The Beatles stage act from 1960 to 1964, this Barrett Strong composition was one of the songs performed at the group's failed January 1, 1962 recording audition with Decca Records in London. One of the songs personally selected by Brian Epstein for The Beatles audition with Decca in 1962. It was selected to demonstate that apart from covering other artists, the group was capable of actually writing their own songs. Written for the 1957 broadway musical, The Music Man, Paul McCartney liked the Peggy Lee version so much it was included in their stage act from 1961 to 1964. It was also one of the songs performed at the Decca audition. This was the first song ever written by John Lennon. It was played at the Decca audition on New Year's Day 1962 and was one of the songs later given to George Martin to hear, which led him to give the group a recording test at the Parlophone division of EMI. The Beatles covered a number of Coasters hits in their stage act including Searchin' and Besame Mucho. This was another Coaster's song that was included in their performances from 1959 until 1963 and was also part of the Decca audition in 1962. Written by Paul McCartney in 1959 after the death of Buddy Holly. Holly proved to be a huge influence on The Beatles, in part because he wrote all of his own songs. The name Beatles is said to have been inspired by his group The Crickets. Another song performed by the group from the late 1950s until 1964. First recorded by Chuck Berry in 1956, it demonstrated the influence American artists had on The Beatles. Sung by John Lennon until 1961, the lead vocal part was then turned over to George Harrison. One of only four songs recorded at EMI studios at 3 Abbey Road, St. John's Wood, on Wednesday, June 6, 1962 for George Martin's audition of The Beatles. The public first heard this song on the BBC radio programme, Teenager's Turn a week later on June 11. Written mostly by Paul McCartney with a little help from John Lennon while the group was playing in Hamburg. This was another of the songs recorded for George Martin on June 6, 1962. It was written for McCartney's Liverpool girlfriend, Dorothy Rhone. Another of the group's Parlophone audition songs recorded for George Martin, this record went on to become The Beatles' first single, reaching #17 in England. Brian Epstein is reported to have ordered 10,000 copies for his record store hoping to land it in the English charts. The harmonica John Lennon played is one he shoplifted in Arnheim, Holland. More evidence of The Beatles' American influences, this was originally released by the Inkster, Michigan group, The Marvelettes in August of 1961. It has the distinction of being Motown Records first #1 hit record. Part of The Beatles stage act until late 1963. This was the song The Beatles used to close all their shows until the middle of 1964 when it was replaced by Long Tall Sally. A beginning-to-end rocker that makes The Isley Brothers original seem tame, John Lennon screamed the vocals in the song that always caused a furor whenever they performed it at Liverpool's Cavern Club.